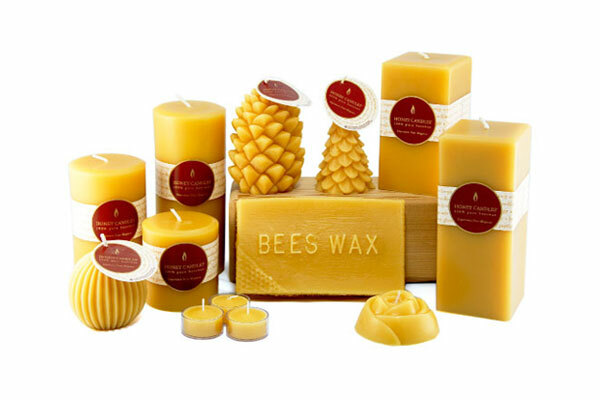 Beeswax Candles which are made from 100% pure beeswax. Apart from being beautiful, honey scented and ever lasting candles they have great health benefits which I think you should know and keep in mind for the next time you look at the horrific department store candles. Beeswax candles health benefits are especially important to keep in mind if you have little kids, as they are much more sensitive to the chemicals which are being excreted from burning of paraffin, soy or palm wax candles. When you burn a beeswax candle you actually purify the air in the room as opposed to contaminating it when burning paraffin/soy/palm wax candles. There is a beautiful synergy between us, humans and the burning beeswax candles and if you follow me, you know that I believe deeply that we should strive to be aligned with this synergy and not do things that break it. So If you live in the city, for example, your household air probably contains allergens, dust and air borne toxins, otherwise known as free radicals, which interfere with air quality. Next time, instead of using an electric air purifier try burning beeswax candles which purify, clean and refresh the air as they burn. Since we started burning these candles in our living room, our kids stopped having chronic coughs which drove me crazy as a mom. I think beeswax candles have much to do with this! A 100% pure beeswax candle would not be mixed with other waxes and therefore its production is not interfering with our Eco-system. I believe that as visitors to this planet we bare the responsibility of protecting the environment, therefore when buying products for self use choose them consciously and considerably. These candles are colored with a special dye which is non-hazardous, non-carcinogenic, not tested on animals and solvent free. It is up to us to keep this planet harmonious and in a perfect equilibrium as it was designed in the first place, remember that each dollar you spend is a vote! I encourage you to ‘vote’ for smarter products for yourself and for the environment. The beehive has been known for centuries to give very unique spiritual and energetic powers. Honey, for example, is considered to this day a gift from God and endowed with esoteric and mystical qualities. The burning of a beeswax candle is one way of getting the wisdom of the bee and a world of benefits from products which are made from the bee. I am sure you will notice the difference between breathing the fumes of a beeswax candle and a paraffin candle. When we consume high endurance foods (like honey) eventually we become high endurance beings, and the same logic applies to using products. Choosing products that are made with high consciousness we fill ourselves with the same energy which makes us strong and keeps us connected to mother nature. In holy Hebrew, the meaning of the word bee is ‘dvora’, and the root of this word is ‘davar’ meaning word, with the message being that the bee brings the Divine word. I use beeswax candles to light Shabbat Candles. Pure beeswax candles’ wicks are made from top quality 100% cotton or cotton with a paper twist and are coated with wax for easy lighting. Paraffin candles use zinc and lead to make the wicks which are carcinogenic and actually create negative ions in the air. Negative ions make us feel tired, depressed, sick and in pain so we want to get rid of them. If you burn candles on a regular basis make sure to use only 100% beeswax candles to discharge yourself off of negative energy and negative ions. Honey bees are a vital component to maintaining our Eco-system as they pollinate 1/3 of the food we eat including almonds, apples, strawberries and many of the beautiful flowers we enjoy. When you choose to buy beeswax candles you actually support beekeepers who continue to establish apiaries and therefore keep this industry alive. Keep in mind that these candles are a little bit more expensive, but don’t let this fool you since they actually burn longer! We buy our beeswax candles from Honey Candles who make their candles in the mountains of beautiful British Columbia, in Canada. I hope this is inspiring enough to at least explore the market for these incredible candles that do so much other than just offer a honey aroma, a golden glow, and the longest, purest burn of any candle. This is a great article. I recently did some exploring myself into the dangers of wax candles due to the chemicals they release and also found that if you still want a flame that beeswax is the best option. Might I suggest thought that if you want to be 100% fire safe that you opt for flameless tea light candles….. This way your readers will not become one of the statistics of homeowners that experience a house fire that has been caused by an open flame. Another thing of note with regular candles is that ones ith fragrances are even more dangerous as the ‘fragrance’ is a concoction of chemicals that are combined with a lead wick. So let bough they seem nice they cn actually be the worst for you. An awesome article about an awesome company! I have had the privilege of touring the Honey Candles manufacturing facility, getting to know the staff and ownership and I can attest to the incredibly high standards that are evident in their product development and in the way they do business. Your article does a great job of describing the many benefits that may not be as apparent but are part of what makes you feel good when using Honey Candles’ products. Not only do they make great candles… they are truly a company with a conscience!